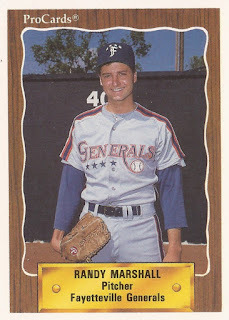 Randy Marshall got off to about as hot a start for Fayetteville in 1990 as anyone, according to The Detroit Free Press. The Fayetteville starter won his first 10 starts for a 10-0 record, The Free Press wrote. "I'm surprised by the start," Marshall told The Free Press late that May. "But then I'm not surprised because of the way I approach each game. I go out to win every time." 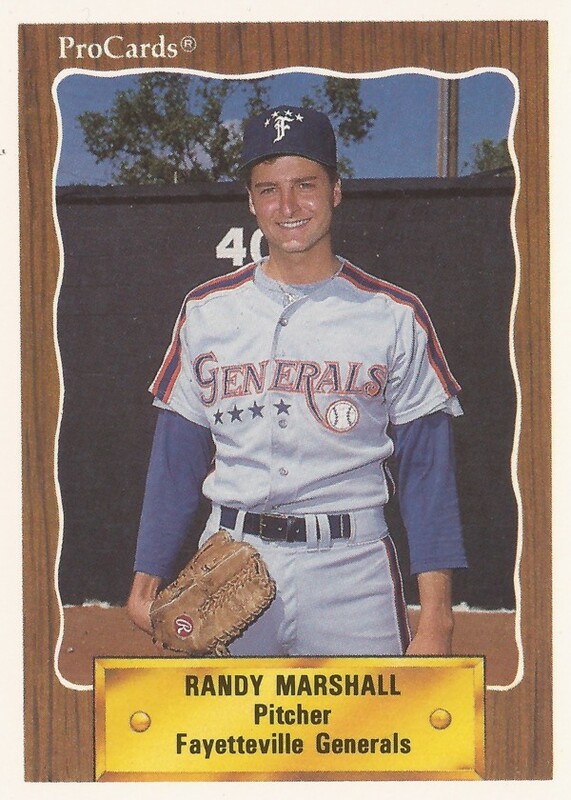 Marshall went on to go 13-0 for the single-A Generals and 20-2 on the year after a promotion to high-A Lakeland. That season marked his second as a pro. He went on to get in eight seasons. He made AAA, but not the majors. Marshall's career began in 1989, taken by the Tigers late in the 1988 draft out of Eastern Michigan University. Marshall started with the Tigers at single-A Fayetteville and short-season Niagara Falls in 1989. He went 5-5 between them, with a 3.97 ERA. He then returned to Fayetteville for 1990 and took off. In 14 starts there, he went 13-0, with a 1.33 ERA. He had one no-decision in that stretch, a 10-inning, one-run performance. He went seven in one April win, allowing four runs. In another, he threw a complete game shutout for a 1-0 victory. Over his first four wins, he struck out 27 and walked just one, The Fayetteville Observer wrote. That off-season, Marshall won the Bobby Bonds Award for the nation's top minor league player. Marshall then made AA London in 1991, having a tougher time. He went 8-10, with a 4.47 ERA. He picked up one of his wins in a July 6-2 London victory. His first win came in a May four-hitter. He moved to the Mets system and AAA Tidewater for 1992, then AAA Colorado Springs with the Rockies in 1993 and 1994. Marshall returned to the Tigers for 1995, playing that year and the next at AAA Toledo. He held a 1.58 ERA in mid-May 1995, giving up two runs. In August 1996, Marshall threw five innings of a seven-inning no-hitter. "This is great," Marshall told The Toledo Blade after the no-hitter. "I was hoping I could go the whole way, but I was just happy to be a part of a no-hitter." Marshall went 7-3, with a 2.30 ERA in 1995, then 3-5, with a 4.15 ERA in 1996, ending his affiliated career. Marshall then rounded out his professional career in Taiwan in 1997, with the Sinon Bulls. Fayetteville Observer, April 28, 1990: Where are they now?